Mischief & Mayhem is a great name for rebel violinist Jenny Scheinman's new band which features co-conspirators Nels Cline on guitar‚ Todd Sickafoose on bass and Jim Black on drums/percussion. As I waited on the sweltering stairwell that leads to one of New York's most famous basements -- the Village Vanguard -- I knew that this band would be capable of making a lot of noise‚ which they certainly did. Surprisingly the group also proved themselves to be a fluid‚ fleet-footed and seemingly well-rehearsed unit. I say surprisingly not because I expected anything sloppy to come from these accomplished players but because it is hard to imagine that four people as busy as they are can find much time for rehearsal. Nevertheless the theme of the night for me was cohesion. Yes there were some noisy moments -- thanks mostly to Jenny's inventive control of her axe and Nels' mastery of effects on his -- but more than anything I was impressed with the way these four could move together. Songs built in intensity (and sometimes volume) in a way that reminded me more often than not of an instrumental rock band. At one point it dawned on me that the band could -- and probably should -- have been playing at the Pitchfork Festival‚ the hipster convention that was taking place in Chicago the same weekend. At other‚ jazzier‚ moments‚ the quartet's sound would have fit in a French bistro. Except for a few abstract moments‚ Black and Sickafoose spent the evening playing deep in the pocket and Nels was not far behind. While he had plenty of standout moments‚ Nels was mostly adding color and helping move things along as a member of the rhythm section -- albeit a very famous member (I almost got through this review without mentioning that Nels is in Wilco!). Jenny took her time but when she got going the stage was hers. If there is another violin player out there with Jenny's intensity and range -- I would love to meet them. Maybe it's the innate nature of the violin/fiddle but her playing seemingly references a truly broad spectrum of genres -- gypsy jazz‚ bluegrass‚ chamber music‚ etc. It's all there at once and it's delightful. This is a band that really deserves to be heard so hopefully they record soon and continue to perform regularly. The gorgeous acoustics of the Vanguard fit the group well‚ though I suspect that they could tap further into that mischief and mayhem if they were booked in a larger room. 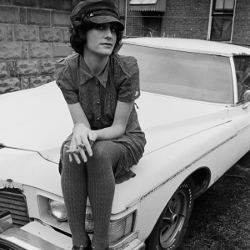 Blog: Listen: Jenny Scheinman - "A Ride with Polly Jean"
Blog: Funky Monday: Les McCann & Eddie Harris - "Compared to What"